Preheat the grill to 250°C/475°F/ High. Cut the baguette into 1 cm/½ inch slices, brush both sides with a little oil and toast under the grill for a couple of minutes until golden brown. Mix the cheese with the crème fraiche and put a dollop on each crostini. Cut the pears into 12 wedges. Brush with oil and arrange with the crostini on a baking tray. Sprinkle a little sugar over both creamed cheese and pears and grill until the creamed cheese is nicely browned. Remove and serve on a bed of lettuce leaves. 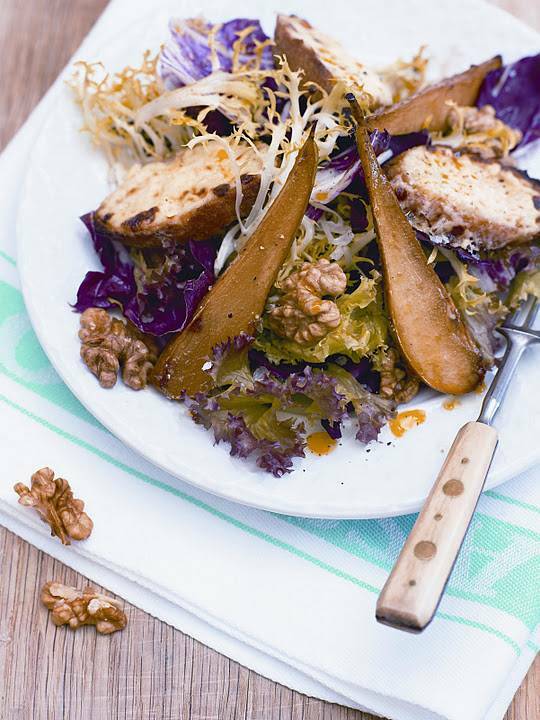 Scatter with walnuts and drizzle with rapeseed oil if desired. Season with salt and pepper. Preheat the oven to 250°C/475°F/Gas 9. Mix the yeast with water warmed to 37°C/98°F. Add sugar, oil, flour, salt and fennel seeds and knead for 10 minutes until the dough is smooth and elastic. Wash the mussels and tap them sharply. Discard any that do not shut. Divide the dough into 20 small pieces or make 2 large pizzas. Roll out each one thinly. Arrange the filling on top and sprinkle with cheese. 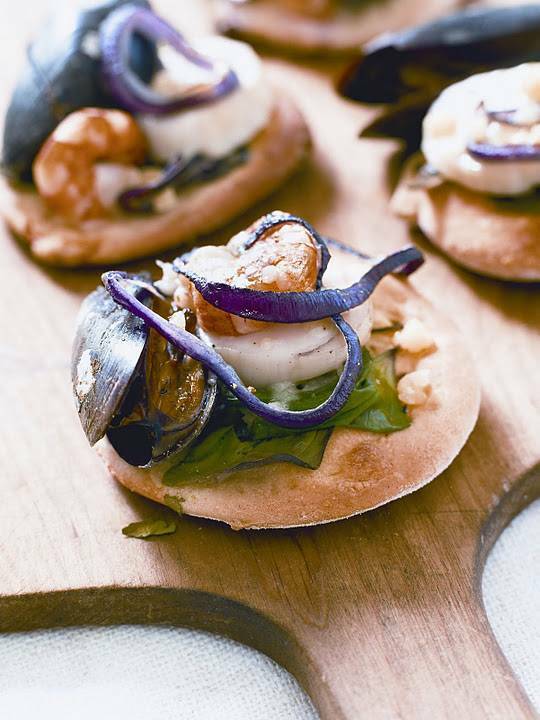 Bake for 10 minutes or until the mussels have opened and the pizzas are golden brown. "Belvoir Fruit Farms Cranberry Cupcakes And Raspberry Blush"
We mostly eat out on Valentine Days. I've not prepared any special meal before but this post is tempting me to give it a try.